For the happiest of couples, the time when one doesn’t seem like themselves to the other can be the most sustained traumatic time to test any love. This play is a powerful fantasy about one such couple facing a bizarrely premature version of that situation, one told with emotional heft and special insight. After a young man named Peter (Matt Green) meets and falls in love with the eccentric cynical woman Rita (Charlotte Weeks), they agree to be married. 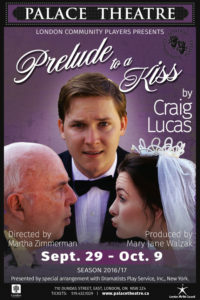 However at the wedding, an elderly stranger (Alan Legg) requests a kiss from the bride and something strange happens. Suddenly, Rita acts nothing like herself and more like she is bluffing her way with her husband. As the real situation dawns on Peter, there seems no way to set things right even as his love is put to the test in the most otherworldly way possible. The greatest test for love is when it is most difficult, and this play is a powerful testament with that. While I don’t care for dedicated and self-contained romance stories, this play is able to encapsulate a believable relationship with a deft mix of humour and passion where the true character of the lovers is the real purpose of the story. A concerted effort to establish the characters is made in the extended prologue decorated with appealing humour and genuine warmth. In effect, the real meat of this play is a clever fable about relationships after one partner has had a traumatic mental crisis like a stroke or a psychotic break. As Peter struggles to comprehend what has happened to his wife, you can understand his confusion and helpless even as you suspect the truth. When the nature of the situation hits home, there is a thrilling suspense and sympathy knowing that Peter cannot explain it anyone else, lest he be written off as crazy. To make this subtle fantasy work, delicately expert acting is necessary and the cast delivers that with aplomb. For instance, Matt Green is perfect as the story’s anchor, a young romantic in a situation right out of The Twilight Zone as he wins you over from the first scene. From confusion to anger to utter helpless in a bizarre predicament of seemingly no escape, Green is perfect as the emotional centre of the story. When he struggles against basic urges in the insane conundrum he is in, you can understand even as you ask yourself if you could do better. Weeks and Legg shine even more brightly as their characters, who have to become completely different from their original personalities even as they are forced to hide the truth with all their resources. To do that requires a real insight of character with a funhouse distortion as they fake it just badly enough to arouse your suspicions. To play essentially two roles at once is a testament to the thespian skill of both and it plays off Green’s lead to create a drama of such imagination and soul. Weeks is obviously having a ball in that regard as the quirky character she playfully established becomes greedy and selfish as her personality gets a change of perspective known to her alone. If anything, Legg is even better, as the prisoner inside his character gains far more than he bargained for even as the situation drifts into the horrific. This stellar performance climaxes with a moving soliloquy that feels so bleak even as the soul inside finds more a reason to live for some happiness than you’d expect. As this trio fights to cope with this predicament, your assumptions will challenged brilliantly as the players work this fable to perfection. All the supporting players do their parts well, but the stand-out is definitely Lori Fellner as Mrs. Boyle. In her major scene, you can see a woman who is struggling to understand why her daughter is so distraught and so inexplicably different, while trying to understand her son-in-law’s pleading that he cannot fully explain. The fact that she could have the understanding to help Peter even when the problem is beyond her comprehension is quietly heartwarming, topping anything I have seen in London theatre. Finally, the stagecraft is a delight to behold. The primary prop is a massive turntable set with three facets that allows the scenes to change instantly as far as set arrangement can allow. Combine that with some sliding platforms for secondary props and the appropriate music and a masterwork staging is evoked with fun and imagination. Fantasy at its best can be a mirror to the real world that a more prosaic story cannot provide. This play is a stellar example of that as a romance that is fantastic in more ways than one.